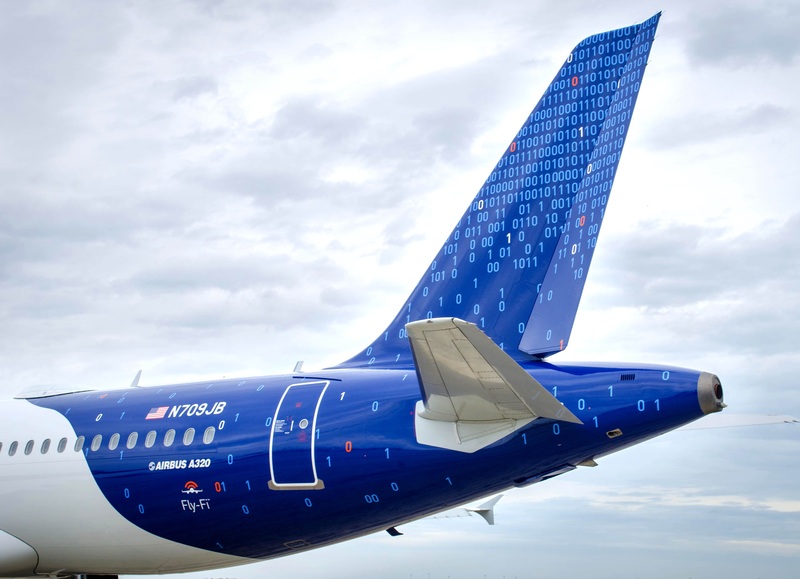 NEW YORK, NY--(Marketwired - May 13, 2014) - Award-winning JetBlue Airways (NASDAQ: JBLU) today introduced its newest custom livery, 'Binary Code,' to celebrate its Fly-Fi service, which delivers broadband Internet in the sky. This one-of-a-kind livery joins JetBlue's fleet on the newly re-christened Airbus 320, "CONNECTED TO 01000010 01001100 01010101 01000101" (N709JB). In December, JetBlue partnered with LiveTV and satellite provider ViaSat to bring Fly-Fi to life. Just six months later, nearly one third of JetBlue's Airbus 320 aircraft are equipped with Fly-Fi, and the service is being added at an average rate of 10 aircraft per month. JetBlue's Fly-Fi Ka-band satellite connectivity, powered by ViaSat's Exede Internet, is eight times faster than older, slower inflight connections offered by other U.S. airlines. "This beauty of a plane truly represents the pride we have in providing our game-changing Fly-Fi service," said Jamie Perry, Director of Product Development at JetBlue. "We recently saw a record 136 connected devices on one of our flights -- all enjoying a great high-speed connection. We've never seen anything like that from other inflight Wi-Fi products!" "It is great to see JetBlue showcasing its industry leading internet product," said Glenn Latta, President of LiveTV. "JetBlue gave us the challenge of creating one of the industry's best internet experience and we're proud to have delivered a solution that, combined with our live television offering, is a truly 'At Home in the Air' experience." "JetBlue always seems to add something special to whatever they do and this creative design is another example," said Don Buchman, VP Exede Mobility, "We appreciate JetBlue highlighting our Exede Internet consumer network that powers Fly-Fi, which is how passengers get the same great satellite Internet in-flight as they can at home." "CONNECTED TO 01000010 01001100 01010101 01000101" rejoins JetBlue's fleet of 196 aircraft and can be spotted flying throughout JetBlue's route network, providing customers with the next-generation of inflight Wi-Fi. JetBlue is New York's Hometown Airline, and a leading carrier in Boston, Fort Lauderdale/Hollywood, Los Angeles (Long Beach), Orlando, and San Juan. JetBlue carries more than 30 million customers a year to 85 cities in the U.S., Caribbean, and Latin America with an average of 825 daily flights. New service to Hyannis, Mass. begins this summer. With JetBlue, all seats are assigned, all fares are one-way, an overnight stay is never required and the first checked bag is free (subject to weight and size limits and exceptions for itineraries including flights marketed or operated by other airlines). For more information please visit JetBlue.com.